Unfortunately, despite “assault weapon” and “assault rifle” being clearly defined in the Associated Press Stylebook (prior to 2013, the AP’s definition of “assault weapon” even included the warning “Not synonymous with assault rifle, which can be used in fully automatic mode”), the media often conflates these two similar-sounding phrases—using “assault rifle” when they mean “assault weapon”—thereby further confusing the public on the relationship between so-called “assault weapons” and true weapons of war. None of the assault rifles found on the battlefields of Afghanistan, Iraq, or Vietnam are available for sale in American sporting goods stores. In fact, of all the guns for sale at your local sporting goods store, the three most likely to have been found on any of those battlefields are the Remington 700 bolt-action hunting rifle (used by U.S. snipers since the 1960s), the Colt M1911 pistol (used by U.S. troops since the early 1900s), and the Beretta M9 pistol (used by U.S. troops since the 1980s). In the aftermath of the October 1, 2017, Las Vegas shooting (the worst mass shooting in U.S. history), the debate over “bump stocks,” which turn a semiautomatic rifle into a pseudo-automatic rifle capable of closely matching the rate of fire of a fully automatic firearm, clearly illustrates the difference in lethality between semiautomatic and fully automatic fire. An analysis by The New York Times compared a short audio clip of a fully automatic rifle at a firing range with short clips from the Las Vegas shooting and the June 12, 2016, shooting at the Pulse nightclub in Orlando, Florida. 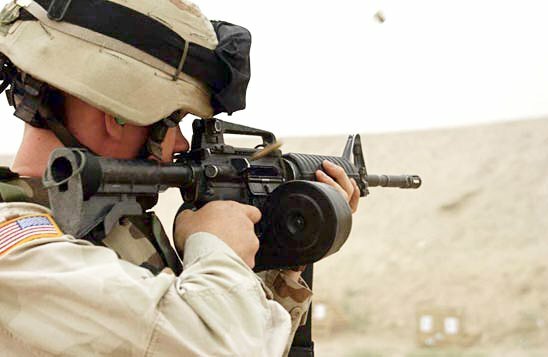 Over seven seconds, the fully automatic rifle maintained a rate of fire of 14 rounds per second. Over 10 seconds, the Las Vegas shooter’s pseudo-automatic rifle maintained a rate of fire of nine rounds per second. Over nine seconds, the Orlando shooter’s semiautomatic rifle maintained a rate of fire of 2.7 rounds per second (an exceptionally fast rate of fire for a semiautomatic rifle but still only 1/3 the rate of the pseudo-automatic rifle and 1/5 the rate of the fully automatic rifle). Although some journalists and proponents of banning “assault weapons” are quick to point out that U.S. soldiers are trained to fire their assault rifles in semiautomatic mode under most circumstances, the capability to switch to burst or fully automatic fire when extreme force is needed is the defining characteristic of an assault rifle. That characteristic is what differentiated the German Sturmgewehr, the first assault rifle, from the rifles that came before it. The exceptional lethality of fully automatic firearms is the reason the U.S. has heavily regulated such weapons since 1934. Without the capacity to fire multiple rounds per pull of the trigger, there is little functional distinction between a military-style “assault weapon” and a semiautomatic hunting rifle, a semiautomatic handgun, or even a revolver. This segment makes a point of showing that rounds fired from the banned rifle can penetrate a bulletproof vest, despite the fact that BOTH rifles (which fire identical ammunition) are equally capable (as is any hunting rifle) of penetrating the same bulletproof vest. It’s true that California law allows possession of some semiautomatic rifles; however, under the version of California’s “assault weapons” ban in effect in 2015, semiautomatic AR-15 rifles like the ones used by the San Bernardino shooters were illegal unless the gun’s magazine was affixed via a bullet button or similar device (California has since banned bullet buttons). Contrary to Jarrett’s claim, an “assault weapon” is not fully automatic and does not “continue to fire when the trigger is pressed.” At one point during this discussion, Jarrett uses the terms “assault rifle” and “assault weapon” interchangeably. Most egregiously, Jarrett claims that a bullet button (so named because the tip of a bullet can be inserted into the device to remove the magazine from the weapon) is actually a device that, through some sort of legal loophole, allows a semiautomatic rifle to be turned into a fully automatic machine gun with the press of a button. 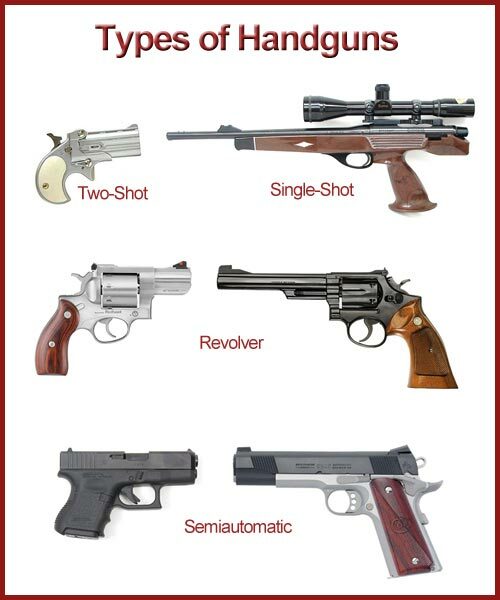 In reality, semiautomatic firearms do not have a switch that allows them to fire faster or slower. They have only one firing mode—they fire one round each time the trigger is pulled. As with virtually all U.S. law enforcement agencies, the pistols carried by the Capitol Police are semiautomatic and have the same rate of fire as a semiautomatic rifle or any other semiautomatic firearm. What about the claim that a pistol grip coupled with the relatively low recoil of an “assault weapon” makes it easier to “spray fire” these weapons? Pistol grips and low recoil improve accuracy during fully automatic fire because they help prevent muzzle climb; however, those features have little impact on semiautomatic fire because the muzzle of the gun has enough time between shots (it only needs a fraction of a second) to fall back into line with the target. Even with a fully automatic rifle, those features wouldn’t be a major factor in a mass-shooting scenario because accuracy is not a significant concern at short distances. If your target is ten feet away, your muzzle can climb six inches and still be on target. Aren’t the high-powered rounds fired by “assault weapons” capable of penetrating police body armor? The soft body armor (Type I – IIIA) worn by police officers is designed to stop handgun fire, not rifle fire. Any centerfire rifle ammunition is capable of penetrating police body armor. The most-common “assault weapon” rounds are significantly less powerful than the most-common hunting rifle rounds. NOTE: Another name for the 5.56×45 is .223. Some opponents of “assault weapons” argue that, because the high-speed 5.56/.223 round fired by most AR-15s is extremely damaging to living tissue, the AR-15 is an unusually dangerous firearm that should not be available to the average citizen. This ignores the fact that the AR-15 is a modular system that can be configured to accept any of a multitude of calibers. Because the argument about 5.56/.223 rounds being too fast cannot be made about other AR-15-adaptable rounds such as the .300 BLK and the 7.62×39 (a round popularized by the infamous AK-47), it would make more sense for gun control activists to seek a ban on the 5.56/.223 cartridge, not the AR-15 rifle (which is one of numerous firearms capable of firing the 5.56/.223). 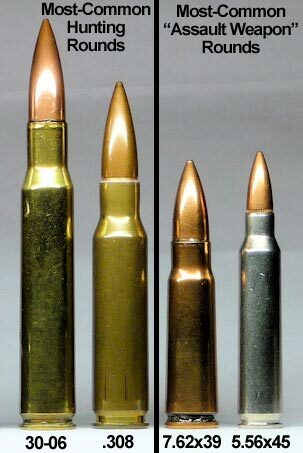 The most likely reason gun control activists hesitate to seek a ban on 5.56/.223 ammunition is that the same characteristics that make the 5.56/.223 round so devastating also make most hunting rounds equally devastating, if not more so. Compared to the 5.56/.223, the ubiquitous .308 Winchester hunting round projects a much heavier bullet at a comparable rate of speed, resulting in much higher kinetic energy. The .22-250 hunting round has the same size bullet as a 5.56/.223 but a much larger powder load, resulting in a round that travels 500 feet per second faster than the 5.56/.223. Yes, 223 is more “devastating” than 9mm in soft tissue – but common hunting rounds like 30-06, 270 Winchester, and 300 Win Mag are far more “devastating” than 223. The average person would not know that from watching this video – they would be left with the thought that the 223 is exceptionally devastating in comparison with a “common hunting round,” the 22LR. They wouldn’t know that cartridges used for hunting larger animals look far more ‘devastating’ in ballistics gel. After watching this NPR video, the average person wouldn’t know that common centerfire cartridges even exist. When people were injured with semiautomatic firearms as compared with other types of guns, however, it appeared the proportion of people who eventually died was roughly equal—leading to fatalities around 44 percent of the time regardless of weapon used. [Adil Haider, a trauma and critical care surgeon who directs the Center for Surgery and Public Health at BWH,] attributes the similar rate to the fact that in each of these incidents an active shooter would likely be shooting at close range in a confined space. By claiming that the damage done by the AR-15 rifle is a result of its “military style” rather than its high-speed ammunition, gun control activists are able to perpetuate the myth that these types of injuries can be avoided by banning only firearms that serve, as they claim, “no sporting purpose.” To admit that the rifle’s design has nothing to do with the wound cavity it creates would be to admit that an effective ban would have to include not only so-called “assault weapons” but also many popular hunting rifles and calibers. 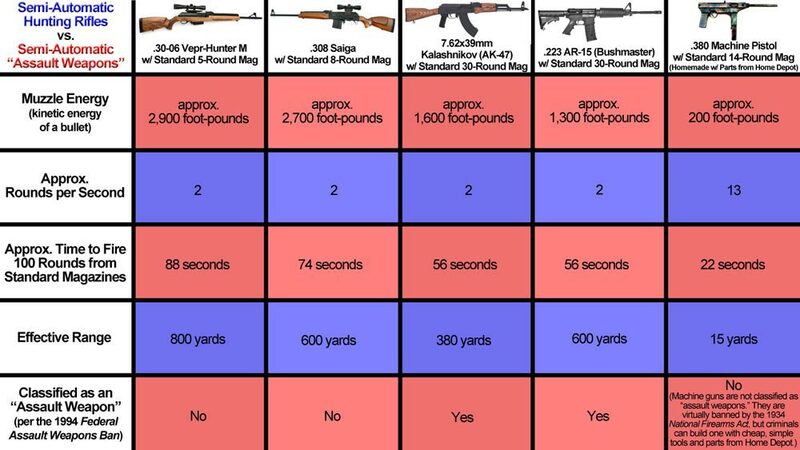 How do “assault weapons” compare to semiautomatic hunting rifles? NOTE 1: Another name for the .223 is 5.56×45. NOTE 2: If you doubt that a machine gun can be built with parts and tools from Home Depot, take a look at this (be advised that building a machine gun is a federal offense in the U.S). How does a ban on “assault weapons” work? With only two minor exceptions*, THIS is an excellent article on the current debate over whether America should pass another “assault weapons” ban. *The article mentions that the 1994 “Federal Assault Weapons Ban” banned some weapons capable of accepting a suppressor (aka a silencer) and goes into detail about how suppressors work and why they were invented but fails to mention that, since 1934, the “National Firearms Act” has required anyone wishing to purchase a suppressor to pay a $200 tax (licensing fee), pass an FBI background check (that takes about six months to complete), and either receive the written approval of his or her local chief of police (or county sheriff if living in an unincorporated area) or create a legal trust through with to purchase the silencer. The omission of these facts creates the misleading impression that suppressors were/are readily available to the general public. The article also cites a widely circulated but highly dubious statistic about Americans using firearms in self-defense more than two million times each year. This statistic is based on a 1995 phone survey of approximately five thousand respondents, conducted by criminologist Gary Kleck, a professor at Florida State University. More-conservative estimates place the number somewhere between a hundred thousand and several hundred thousand. Despite its derisive use of the word “liberal,” THIS is a very good article on the popular AR-15 (aka Bushmaster) rifle. For another perspective, this article, which begins, “I’m a liberal, and I own an AR-15,” is also quite good. Opponents also point to a study finding that there were fewer school shooting deaths in the years before and after the AWB than during the AWB; however, like the claim about mass shootings in general, this one fails to look at the types of weapons used. This study covered 10 years during which the AWB was in effect and 15 years during which the AWB was not in effect. During that 25-year period, the vast majority of school shooting deaths, both during and before/after the AWB, were committed with handguns. Numerous others were committed with shotguns and hunting rifles. During the 10 years in which the AWB was in effect, there were as many fatal school shootings involving “assault weapons” as during the 15 years in which the AWB was not in effect. This article does an excellent job rebutting the recent claim that the 1994 “Federal Assault Weapons Ban” resulted in a 37% reduction in mass shooting fatalities. That claim originated in Louis Klarevas’s 2016 book Rampage Nation (which includes some other very shoddy statistical analysis of gun crimes). In short, Klarevas’s book relies on a uniquely contrived definition of “mass shooting” and willfully ignores the types of weapons used in those shootings, in order to reach a conclusion that contradicts the vast majority of studies on the subject. What about “high-capacity” clips and magazines? In the parlance of recreational and professional shooters, a “high-capacity” magazine is one that allows a firearm to be loaded with a greater number of cartridges than the standard capacity for that model of gun. For example, the standard capacity for an M1911 pistol is 7 rounds, so an 8-round magazine is a high-capacity magazine for an M1911. 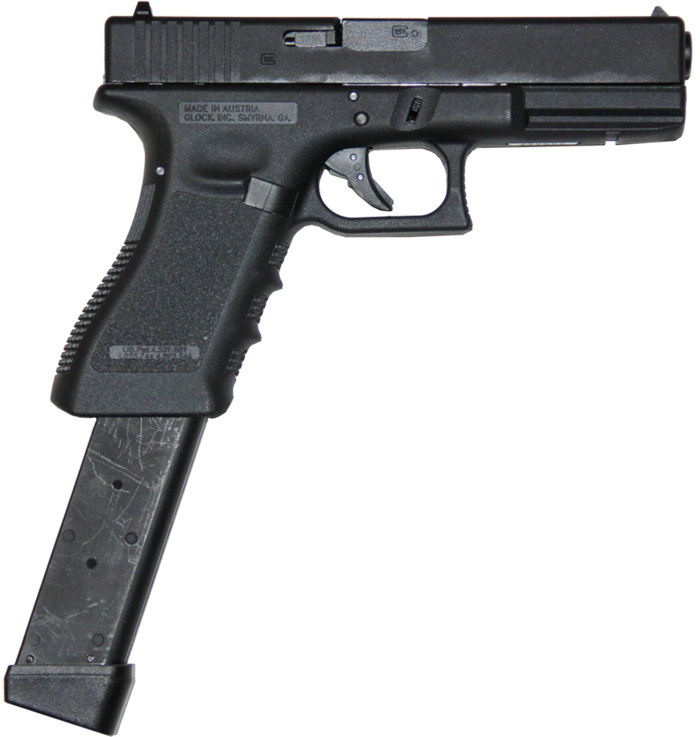 The standard capacity for a Glock 17 pistol is 17 rounds, so a 19-round magazine is a high-capacity magazine for a Glock 17. The standard capacity for an AR-15 rifle is 30 rounds, so a 40-round magazine is a high-capacity magazine for an AR-15. On the other hand, bans on “high-capacity” magazines typically do not consider a firearm’s standard capacity when establishing legal standards. Instead, these laws establish an across-the-board maximum (typically 10 rounds) that cannot be lawfully exceeded. Under such laws, guns that were originally designed to have a standard capacity in excess of the legislated maximum must use shorter magazines or, in the case of pistols, magazines that have been partially plugged to prevent them from being loaded to capacity. The thinking behind such bans is that, in an active shooter scenario, the shooter’s constant need to reload will slow the assault thereby, allowing would-be victims to either flee or fight back. Supporters of such bans point to the 2011 Tucson shooting in which the shooting spree was cut short after the gunman dropped his second magazine while trying to reload, allowing bystanders crouched near his feet to grab the magazine and wrestle him to the ground. Opponents of such bans point out that the Tucson shooting represents an anomaly (a shooter dropping his extra magazine) within an even greater anomaly (one’s odds of being involved in a mass shooting are about the same as one’s odds of being struck by lightning) and argue that survivors of other mass shootings have reported that their assailants reloaded too quickly for anyone to flee or fight. It’s worth noting that the Tucson shooter used a true high-capacity handgun magazine that holds 33-rounds and extends well below the grip of the pistol. The long, heavy, unwieldy nature of this type of magazine may have contributed to the shooter dropping it. Likewise, during the 2012 Aurora, CO, theater shooting, the gunman’s use of a true high-capacity AR-15 drum magazine—a style of magazine notorious for jamming—may have prevented greater loss of life. The rifle reportedly jammed after firing no more than 30 rounds, forcing the shooter to switch to one of the other three guns he was carrying. During the February 14, 2018, Stoneman Douglas High School shooting, the gunman reportedly used low-capacity 10-round magazines because they were easier to carry. The 2007 Norris Hall massacre at Virginia Tech (the worst mass shooting in modern U.S. history prior to the June 12, 2016, shooting at the Pulse nightclub in Orlando, Florida, and still the worst school shooting in U.S. history) lasted between 10 and 12 minutes. During that time, the gunman—using a pair of handguns equipped with 15-round magazines—fired approximately 174 rounds, killing 30 people and wounding 17 others. If he completely emptied each magazine before loading a full one, and if his average reload time was three seconds (pretty easy to accomplish), he reloaded 11 times, accounting for just 33 seconds of the 10- to 12-minute shooting spree. The use of 10-round magazines instead of 15-round magazines would have increased his total shooting time by just 18 seconds. The use of 30-round magazines instead of 15-round magazines would have decreased his total shooting time by just 18 seconds. No adjustment to the size of the killer’s magazines would have significantly altered the amount of time he had to target victims. In THIS article and THIS article, survivors of the Norris Hall shooting recount that the gunman took only a second to reload. He fires the first six rounds at four times the standard rate of fire of the average “assault weapon.” Even with the reload, he fires twelve rounds at twice the standard rate of fire of the average “assault weapon” (without a reload). Aren’t “assault-style” rifles more dangerous than handguns? The semiautomatic rifles that gun control activists describe as “assault-style” or “military-style” (two monikers that, like “assault weapon,” refer to the appearance rather than the function of the firearm) are functionally no different from the semiautomatic handguns that are so ubiquitous in American society—both have the same rate of fire, firing one round each time the trigger is pulled. In a typical active shooter scenario (the focus of most proposed bans on “assault weapons”), the main advantage a shooter gains from using a rifle instead of a handgun is that a rifle is more accurate, even at relatively close range. The previously mentioned Brigham and Women’s Hospital study found that the small fraction of active shooters who use semiautomatic rifles do hit more of their intended targets; however, this increased accuracy is the effect of using a rifle (any rifle), not specifically a semiautomatic rifle or an “assault weapon.” The longer sight radius and heavier weight of a rifle make it easier to shoot accurately. 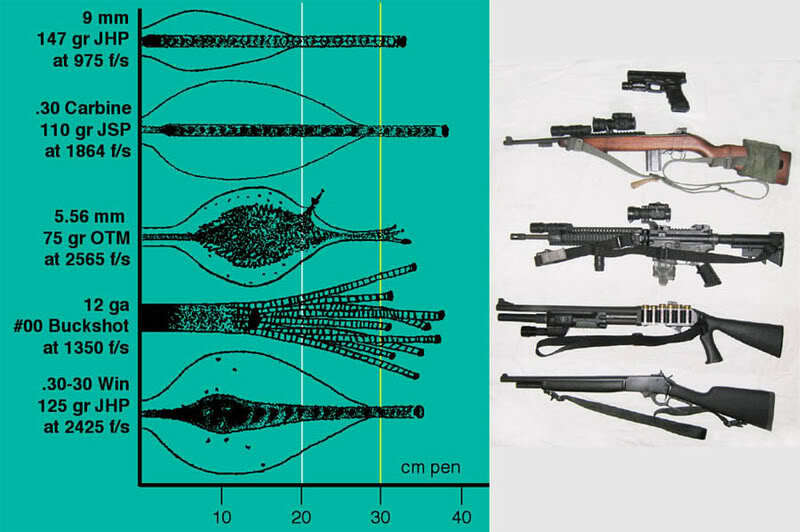 Rifles fire larger, more powerful cartridges and have greater muzzle energy than handguns; however, as shown in the video above, even revolvers, which function on a different mechanical principle than semiautomatic firearms, can match the rate of fire of a semiautomatic “assault weapon.” And as found by the BWH study, a more powerful cartridge and greater muzzle energy doesn’t necessarily translate into greater lethality in an active shooter scenario. Approximately 70% of all gun homicides and 59% of all mass shootings are committed with handguns. Aren’t “assault-style” rifles better suited than other styles of long gun for carrying out mass shootings? As previously explained, the rifles described as “military-style assault weapons” are functionally identical to semiautomatic hunting rifles with detachable magazines. However, semiautomatic rifles are not the only long guns capable of rapid and/or sustained fire. A high rate of fire is also possible with a lever-action or pump-action rifle or shotgun, two non-semiautomatic designs that predate the American Civil War. Although most lever-action and pump-action firearms do not use detachable box magazines, their attached tubular magazines do allow a shooter to reload without first removing unchambered rounds from the gun (as is the case with detachable magazines) and without temporarily disabling the gun by opening the breach (as is the case with integral box magazines). This allows rounds to be added during a lull in shooting, without inhibiting the shooter’s ability to immediately resume shooting. Because of this, an assailant practiced at adding rounds before his or her gun “runs dry” isn’t vulnerable while reloading (i.e., there is never an opportunity for a bystander or potential victim to rush and disarm the assailant, because the assailant always has a loaded, operational firearm in hand). How often are “assault-style” rifles used to commit violent crimes in the U.S? Rifles of any kind (not just “assault weapons”) are used in only 3.5% of all gun homicides and 24% of all mass shootings. From 2010 to 2014, rifles were used to commit an average of 306 homicides per year (an average of 2.4% of all homicides). Almost twice as many people were killed with blunt objects, more than twice as many people were beaten to death with bare hands, and more than five times as many people were stabbed to death. Before the 1994 “Federal Assault Weapons Ban” went into effect, “assault weapons” were used in approximately 2% of all gun crimes. Is this confusion over “assault weapons” purely accidental, or is there a deliberate effort to mislead the public? A 1988 study by the Violence Policy Center, one of the nation’s leading gun control advocacy groups, unabashedly celebrates the public’s confusion over the difference between “assault weapons” and military machine guns. In an October 27, 2007, interview on National Public Radio, then-Miami Police Chief John Timoney—an outspoken proponent of “assault weapon” bans—was asked about that year’s increase in fatal shootings of police officers. During this four-and-a-half-minute interview about 2007’s unusually high number of police shootings, Chief Timoney spoke of little except the dangers police officers face from assault weapons (which he intermittently referred to as “assault rifles” and erroneously claimed are “much more powerful in the bullet themselves”). This is particularly shocking because, according to a January 14, 2008, article published in Chief Timoney’s hometown paper, the Miami Herald, only one U.S. police officer was fatally shot with an “assault weapon” in 2007. Miami police say they consider the spike in shootings this year an “outlier.” They say major crime numbers remain low overall and put much of the blame on the end of the federal Assault Weapons Ban in 2004. Automatic gunfire from easy-to-get guns can spray hundreds of bullets in the blink of an eye. What about U.S. states that already have strict bans on “assault weapons”? There is no correlation between the stringency of a state’s gun control laws and that state’s homicide rate. 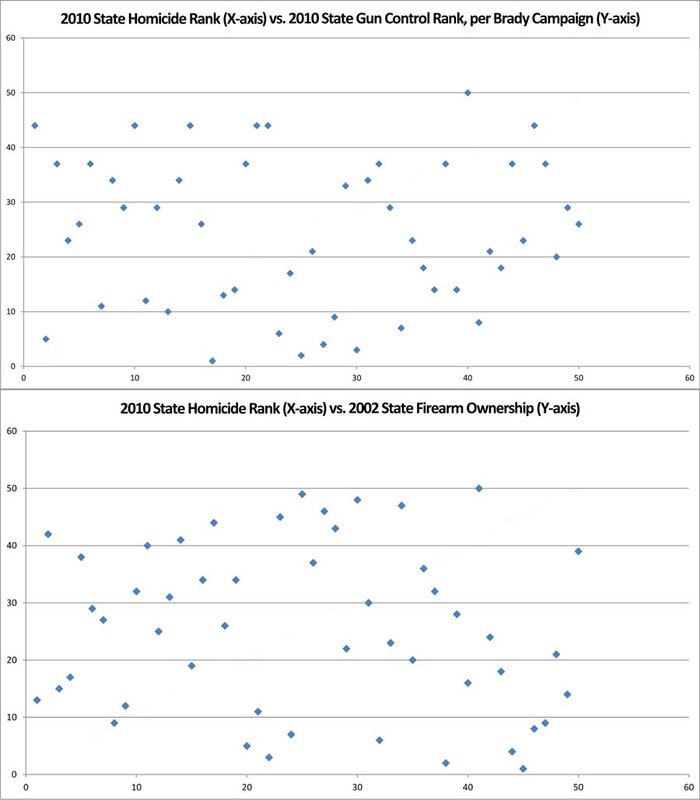 Likewise, there is no correlation between a state’s rate of gun ownership and that state’s homicide rate. What about the claim that bans on “assault weapons” have made England and Australia much safer? Proponents of “assault weapon” bans often speak of the great disparity between the number of gun deaths in the U.S., where “assault weapons” are legal, and the number of gun deaths in England and Australia, where “assault weapons” are banned. Comparing total numbers of gun deaths, rather than overall homicide or violent crime rates, is an act of statistical gamesmanship designed to make such bans appear more effective than they actually are. The U.S. population is five and a half times that of England and Wales combined and thirteen and a half times that of Australia; therefore, the total number of crimes in any category is likely to be much higher in the U.S. than in England or Australia. More-scrupulous advocates for “assault weapon” bans sometimes focus instead on gun death rates, but that still ignores the question of whether such bans actually make the population safer: A simple comparison of U.S. and foreign gun death rates includes U.S. suicides by gun (which are 1.33 times as common as American homicides—by any means—and which comprise approximately two-thirds of all U.S. gun deaths) and excludes foreign homicides committed with weapons other than firearms (if a person plotting murder in Australia can’t find a gun but still manages to carry out the crime with a knife or a club, it’s difficult to argue that Australia’s ban on “assault weapons” made the deceased victim safer). To accurately gauge the safety of a nation, one must look at the overall homicide and violent crime rates. 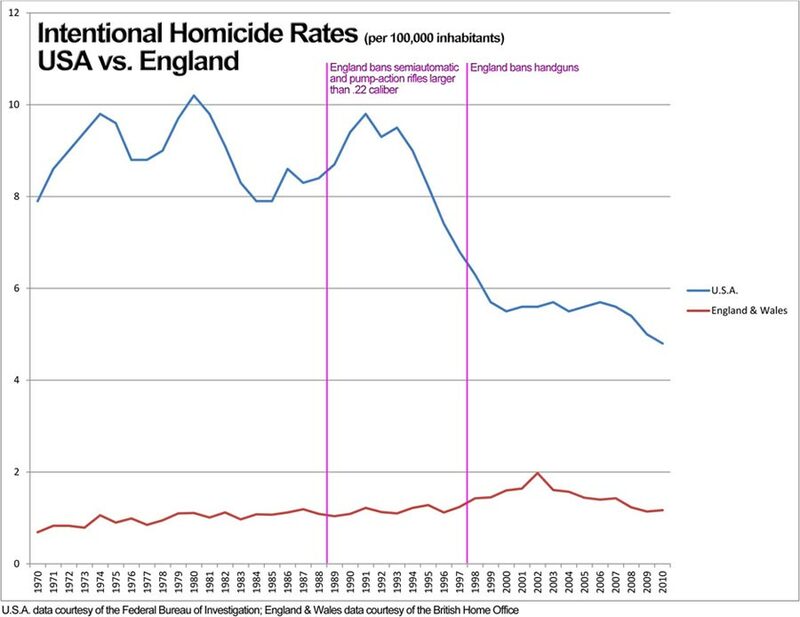 Unfortunately, differences in the way the United States, Australia, and England/Wales collect crime data make it virtually impossible to precisely compare overall violent crime rates. 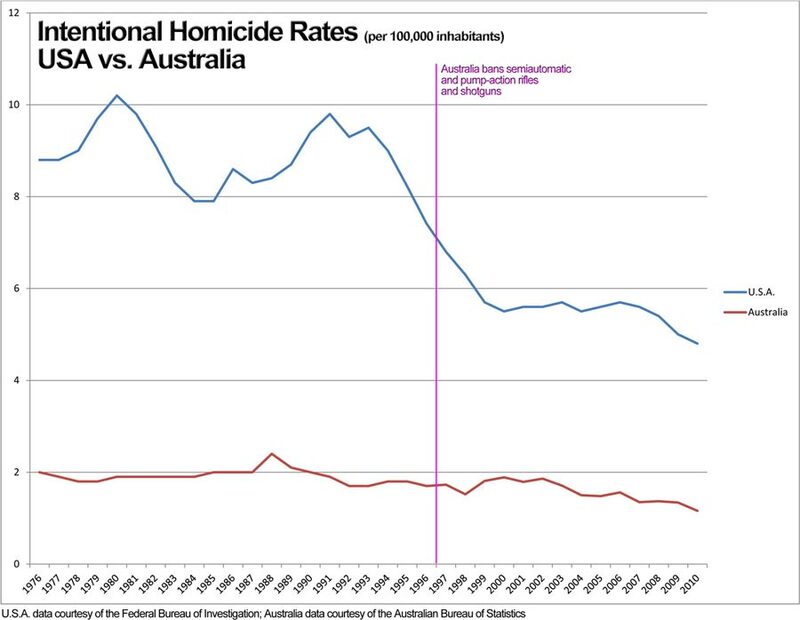 However, it is possible to compare homicide rates. 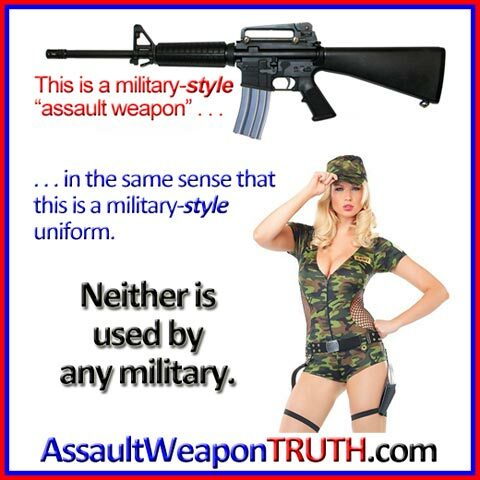 For a simplified tutorial on “assault weapons,” view the slideshow at AssaultWeapon.info.